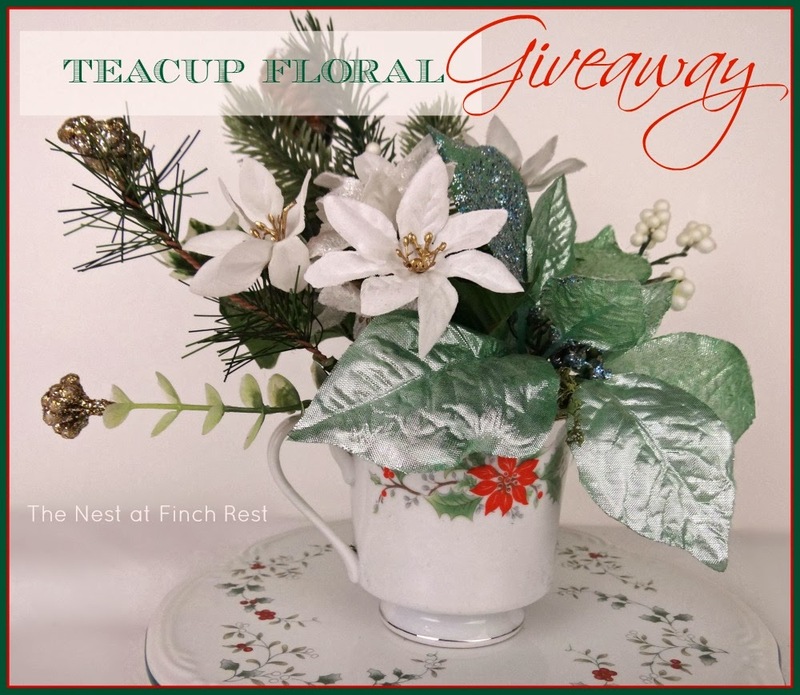 The Nest at Finch Rest: Christmas Teacup Floral GIVEAWAY! and using odd assorted extra teacups is frugally fun! I had a very similar giveaway like this last year. BE A FOLLOWER AND LEAVE A COMMENT ON THIS POST. with your email addy so I can contact you should you win! USA and Canada only please. can't afford to send anywhere else. The Finch Rest Emporium and not included in this giveaway. Be sure to stop by at the shop soon - I'm adding new things daily! Hi Michele! Oh, that's so pretty. The little tea cup is so elegant and love your arrangement. No, those little Christmas trees were picked up at Hobby Lobby many years ago. I love them though. I am a follower of your lovely blog. This teacup is so cute! You don't often see a Christmas-y teacup. I am already a follower of your blog and enjoybit very much. The tea cup arrangement is just precious. Thanks for the great giveaway! That is just so pretty! You are so talented with the florals! I still haven't done any Christmas decorating...how about you? I am sure...that even with your "changin it up"...you will win! I am feeling so lazy this year! However....I know a cute little teacup that might motivate me! P.S. Pick me! Pick me! Your tea cup is beautiful and you did such a great job on decorating. Please sign me up for the give-a-way. I am a follower. Michele, that is a beautiful teacup arrangement! You are so talented my friend, and generous to do another giveaway. I follow your blog with pleasure. Beautiful arrangement, and having a tea cup for the base makes it all the more charming. You know I am a follower, and love your blog. Hope you are staying warm and cozy. Your teacup floral is adorable, Michele! I would love to win it, and yes, I am a follower of your lovely blog. Thank you for your very sweet comment and for sharing this at Tea Time. Enjoy your day, my friend. Pretty teacup, nicely filled to make a pretty arrangement! Sweet teacup Michele. I am a follower of yours for a long time. Thanks. I am a follower already and so glad I am! What a fun post and teacup! Seeing your teacup brightened my evening. Would love to be entered! Thank you for the chance, Michele! Just subscribed! Thank you and Merry Christmas!